As new college students are getting ready to move into their dorms and campers are getting ready for their summer fun, demand for furniture for dorms & quarters and summer camps is at its seasonal high. Housing and camp directors are in the heat of last minute preparation for the expected masses. As heads are counted, the most common panic-evoking realization is that there are never enough beds! So when it’s time to order bunk beds in a hurry, where do you turn? Searching the internet, it is easy to see that there are a vast number of sellers who offer wood bunk beds. BUT, WHAT MAKES A GOOD WOOD BUNK BED? 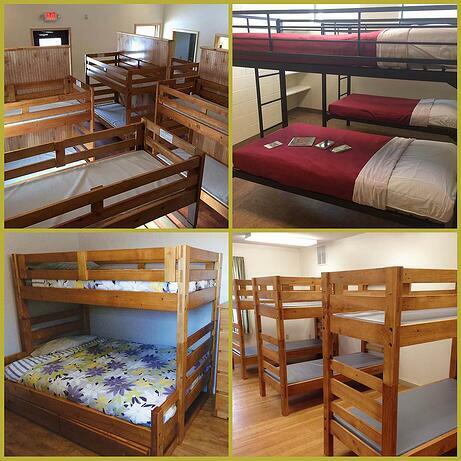 -Many of the wood bunk beds in the market today are made overseas and imported for sale in the US. At first glance many bunk beds have a similar look and advertise similar features. In reality, there are many differences between from bunk to bunk starting with the wood itself. Many less expensive bunk beds are mass produced by one manufacturer and distributed by many retailers like Wal-Mart and Target. Often, no matter where you purchase your bunk beds they are made by the same source and just packaged under private labeling. These “commodity” bunk beds are made with a softer wood that is typically not dried to the highest moisture standards. The more moisture in the wood the less durable the wood will be over time. Kiln drying is the process used to make cut wood ready for manufacturing. Wood that is properly dried will have alower moisture content and will have less chance of splitting over time. Additionally, many inexpensive, imported bunk beds are made with low profile lumber. Instead of using more durable lumber to create 4” posts (2x4 construction), import bed posts are made of 2” posts (1x2 construction) which create a far less beefy bed. For example, most wood bunk beds that are sold and distributed from overseas weigh in at a slight 120 lb. versus a high quality durable bed designed for group living that weigh in at 180 lb.!! The difference between those two weights is a great example of how two things can look similar but be entirely different. So when its time to order those last minute bunks within budget, it is essential to really understand what you are buying. Durable, high quality bunk beds designed and manufactured for colleges and camps are available from contract furniture providers who specialize in high-use environments. Don’t be fooled by claims of quality from mass produced, mass distributed beds primarily sourced from the same overseas manufacturer. The US Consumer Product Safety Commission (CPSC) tracks injuries and complaints from products like wood bunk beds has recalled over 445,000 bunk beds due to consumer injury. In addition, CPSC has had complaints of harm or injury from many other bunk bed manufacturers. When durability and safety are a top priority make sure to work with a reputable company like Furniture Concepts based in Cleveland OH who has a 25 year track record of high-quality wood (and metal) bunk beds. Better quality does not mean high cost so take time to understand what you are buying and always ask for references.